The shape tool allows you to draw various common shapes such as rectangles, circles, etc. Just click the start point then move the mouse to set the shape. Click the end point to set. Right-click (or press Enter) to apply. The size of the area can be controlled using the snap-to-grid feature, in which case the tool will correct the box size to always be a multiple of the grid size. Use the anti-alias mode to enable or disable anti-aliasing. When anti-aliasing is enabled (default); all drawing is done at the sub-pixel level to give you the highest quality results. The border is drawn in color 1, and is width pixels wide. The shape is not filled. 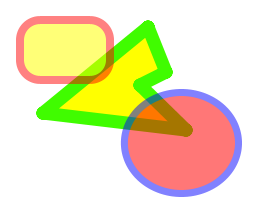 The shape is filled in color 1. No border is drawn around it. The border is drawn in color 1 and is width pixels wide, and the shape is filled in color 2. The border is alpha-blended in color 1 + alpha 1 and is width pixels wide, and the shape is filled with alpha-blending using color 2 + alpha 2.